Are You Experiencing Sudden Tooth Sensitivity? Sudden tooth sensitivity is something that most people experience at some point or another and although a common problem, it can be quite a hindrance in your daily life. Sudden tooth sensitivity or dentin hypersensitivity can be caused by several different factors, and may come and go over time. 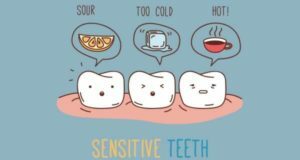 Typically the most common symptom of sensitive teeth is a sharp pain when consuming products that are hot, cold, acidic, or particularly sweet. While this might began as simply a slight nuisance, this sudden sensitivity may likely worsen as time goes on. Therefore we highly recommend scheduling an appointment with your dentist, before this minor problem becomes a major one. Causes for sudden tooth sensitivity and how we can help! While there are many factors that can put wear and tear on your teeth and ultimately cause sudden tooth sensitivity, there are typically four main culprits behind this issue. Clenching/Grinding: clenching and grinding your teeth (or bruxism) might be a side effect of excess stress, excess frustration, malocclusion (jaw misalignment), or perhaps even a reaction to certain medications or stimulants. In addition to the onset of heightened or sudden tooth sensitivity, many patients also report facial pain or frequent headaches accompanying bruxism, thus causing additional discomfort. While making key dietary and lifestyle changes may help alleviate these symptoms, your dentist may also suggest a bruxism appliance or mouth guard. This is a custom fitted device created by your dentist, that provides your jaw with the necessary spacing and cushioning between and around your teeth. These devices can be worn during the day and at night, thus protecting your teeth from acquiring any excess wear. Fractured Tooth: Sometimes known as “cracked tooth syndrome” small cracks or abrasions on your tooth, although difficult to see sometimes, can cause a significant amount of pain and sensitivity in the affected tooth. Treating a fractured tooth typically varies depending on the size and positioning of the damaged area. The treatments can range from bonding, crowns, or in more serious cases a root canal. Although this may seem excessive for a small fracture, it’s important to realize that these cracks will likely grow in time. Therefore a proactive step would be to address the issue now instead of later. Tooth Decay: Simply put, tooth decay is the breakdown of the tooth’s enamel and dentin, due to overexposure to acidic bacteria. While this basic dental issue may seem like an obvious problem, it remains a persistent and easy to overlook issue for many. If detected early, your dentist may apply a sealant solution to protect and fill in the groves of your tooth. However if the enamel has been considerably destroyed, a filling will be needed. Gum Recession: Although periodontal or gum disease is a common issue that can affect people from all walks of life, how you choose to react to such an occurrence often determines how it may affect you individually. Gum disease is a gradual problem that occurs slowly over an extended period, and may initially present itself as inflammation and redness of the gum line. While this may not seem serous at first, the irritated gums may begin bleeding while growing increasingly sensitive to certain food products. This sensitivity is due to the root surface of the tooth becoming exposed resulting in abfraction. To combat this, you dentist may recommend desensitizing toothpaste or gels, as well as using a softened toothbrush to prevent further trauma. Obviously continuing to practice proper oral hygiene under the supervision of your dentist may perhaps be the best solution for this issue as consistently ensuring your gum’s health is ultimately your best option. As you can see, there are many ways in which we can help our patients with painful and sudden tooth sensitivity; however, you should certainly come see us to receive a formal diagnosis. By letting us help you, you are taking a necessary first step in getting to the root of the problem! We look forward to having the opportunity to help you with any restorative care in the case of sudden tooth sensitivity. If you need to schedule a dental appointment, contact us at our south Overland Park office at (913) 647-8700 or our north Overland Park office at (913) 341-2380.